Opening Reception: Friday, February 5 from 6 – 8. The reception will include the free tribute “Ladies Sing the Blues…” at the Blue Martini, which shares the common hallway with the gallery, starting at 7 PM (a second, expanded tribute will be presented at 9 PM with a $5 cover). Gallery hours: Thursday, Friday, and Saturday from 11 AM – midnight; Monday, Tuesday, Wednesday from 11 – 6; Sunday Noon – 6. 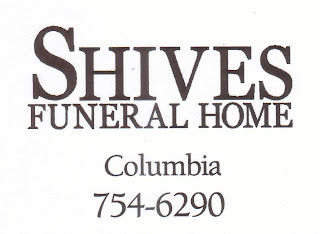 (803) 252-6134 for Gallery 80808/Vista Studios. Blue Martini hours: Thursday, Friday and Saturday from 7 PM until past midnight. Doors opening on the night of the reception at 6 PM. 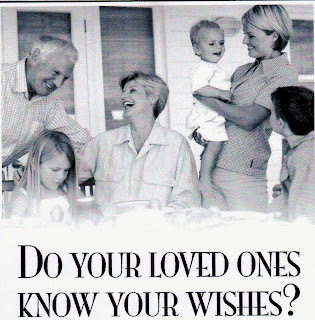 (803) 256-2442. 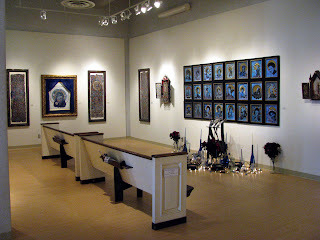 Columbia fiber and installation artist Susan Lenz presents two related installations from Thursday, February 4 through Tuesday, February 16, 2010 at Gallery 80808/Vista Studios, 808 Lady Street in Columbia’s downtown arts and cultural district. The exhibit includes two distinct areas: Blues Chapel and Last Words. 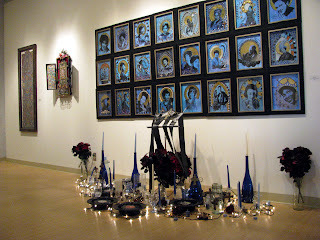 Blues Chapel is an installation honoring the great women of the early Blues world. 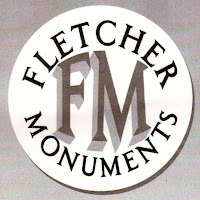 Ma Rainey, Bessie Smith, Nina Simone, Billie Holiday and Alberta Hunter are among the twenty-four singers depicted saint-like above an altar and before mahogany church pews. Music fills the gallery and the opening reception will include a free performance at 7 PM in the Blue Martini, just down the shared hallway. The installation has just returned to Columbia after two months in the Great Denton Arts Council’s Gough Gallery where it received extensive media coverage in the arts-oriented community. If Blues Chapel is considered the “church”, then Last Words is its churchyard where the departed rest. 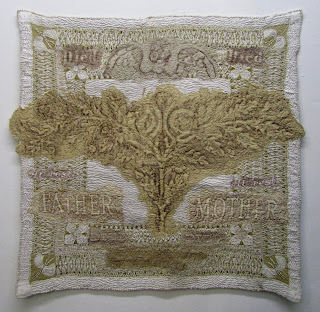 Last Words, based on gravestone rubbings on fabric and collected epitaphs, explores the concepts of remembrance and mortality. 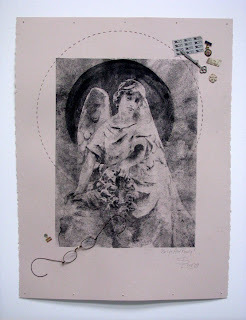 This brand-new body of work is made up of over 30 grave rubbing art quilts, 25 photo transfers stitched with found objects (Angels in Mourning Series), and a focal point of sheer chiffon banners embroidered with hundreds of collected epitaphs. Ladies Sing the Blues…and it never felt so good! 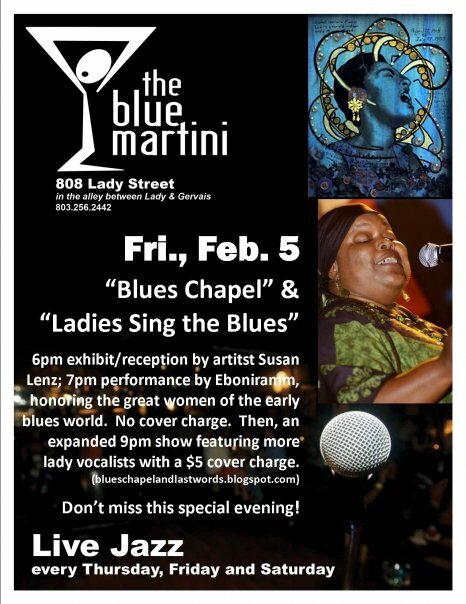 During the art reception on Friday, February 5th, the Blue Martini will present the tribute “Ladies Sing the Blues…” hosted by the “Queen of Blues” Bessie Smith, portrayed by singer Eboniramm. 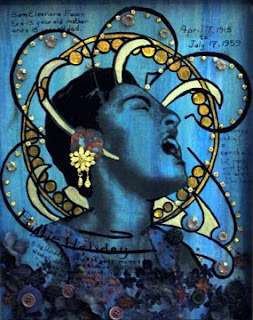 Eboniramm will spotlight Billie Holiday, Ella Fitzgerald, Nina Simone, Anita O’Day and other female blues pioneers (all included in Blue Chapel). The Blue Martini will present a second, expanded “Ladies Sing the Blues…” starting at 9 PM Friday, February 5th. 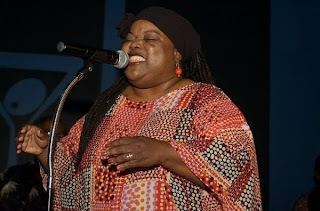 The $5 cover charge will include Eboniramm and more ladies singing the blues. Gallery hours: Thursday, Friday, and Saturday from 11 AM – midnight; Monday, Tuesday, Wednesday from 11 – 6; Sunday Noon – 6. Blue Martini hours: Thursday, Friday and Saturday from 7 PM until past midnight. Doors opening on the night of the reception at 6 PM.